Visit Mayliewan homes for sale for current active MLS® listings of houses, duplexes, townhomes and condos for sale in this northeast Edmonton neighbourhood that is also known as Cherry Grove. The average selling price for a home in Mayliewan so far this year has reached $409,574. That selling price is down from the average selling price in 2015, that year Mayliewan was selling on average for $454,216. The average price has fallen due to a higher percentage of smaller homes and homes with double detached garages selling in 2016. These average selling price values above are based on a single family detached home sale; the other property classes such as duplexes or condominiums are not included in these average selling price values. 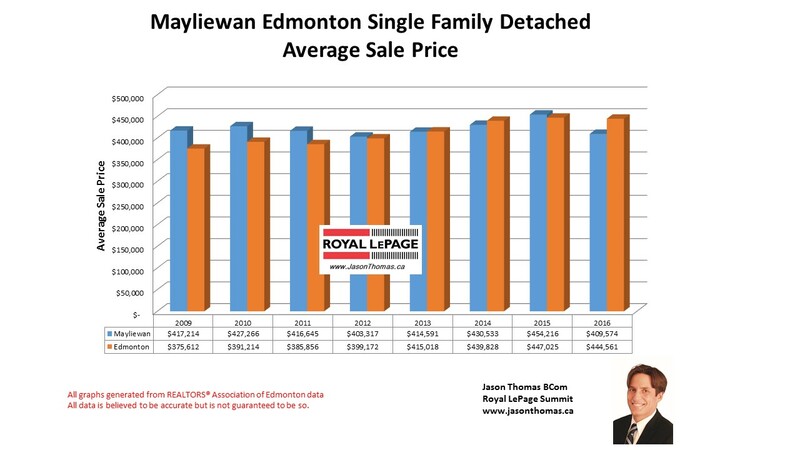 Looking at the statistics closer in the upper end price market segment of Mayliewan Edmonton, the highest price that a home sold for in 2016 was $540,100. At the other end of the price range, in the entry level market for Mayliewan, the most affordable priced home sale in the neighbourhood sold for $302,000. On average it took 51 days to sell a home in Mayliewan in 2016. This is a couple days slower than the Edmonton average days on market of 49 days in last year. To view graphs on other Edmonton neighbourhoods visit Edmonton House Selling Prices by Neighbourhood.